How To Give Your Kid The Best. Christmas. Ever. And if there’s one thing I’ve learned about our little love nugget over the months, it’s that he cannot care LESS for fancy toys he’s been given throughout… In fact, it seems the cheaper the toy is, the more he wants to play with ’em! And by “toy” I mean “not a toy,” and by “play” I mean, “do something he thinks he’s not allowed to do” ;) But what are the holidays for, right? 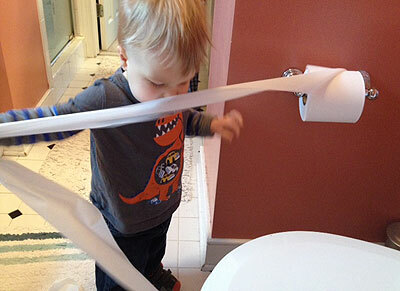 And not the fake “toy” kind either, it has to be the real deal or nothing – toddlers are smart!! They want the heavy real kinds that mom and dad have, and they want to find them right where yours go too. Which of course you’ve hidden away so he *thinks* he’s getting the real ones, but really we’re the ones outsmarting them. *Evil laugh* So what you have to do is ask your family and friends to give you any they’re no longer using (and we all know they have some! ), so it costs you exactly nothing, and you’re helping them clean up their junk too. I recommend asking those “Joneses” neighbors of yours if you have any. They’re constantly upgrading their TV/DVDs and those remotes are the prized ones! They’ve got the most buttons to push and they light up too! This one’s a recent occurrence in our household. Every time he sees an empty jug sitting there on the counter ready to be recycled, he points and proclamates until we hand it over to him thus converting it into a toy. To which he then scurries away to play with his secret find in hiding, knowing full well we’ll be coming after him shortly to take it away. I think they like the crinkly sound it makes when they bang it over their heads and your furniture… He will be getting two of these for Xmas this year. 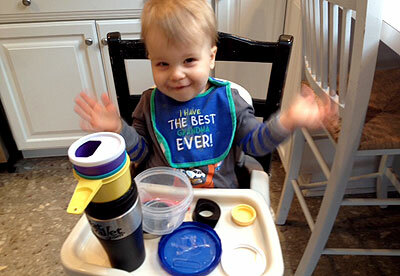 Alternative ideas: Empty orange juice bottles, water bottles, soda bottles (not to be confused with *cans,* a no-no! ), and any other plastic containers you can find. Extra credit: Fill them with a little rice – they make excellent rattlers. Precaution: Wash them out well!! You don’t even want to know how bad sour milk smells… And it’s worse when it hovers in the air and you can’t for the life of you FIND where it’s coming from! This could just be *our* kid, I’m not too sure, but that guy will NOT touch his breakfast unless he’s able to play with some measuring cups and spoons throughout. He’ll put them one by one into tupperwares, put their lids on, and then undo everything and repeat incessantly. And luckily you can find these all over peoples’ houses too! Everyone has miss-matching containers they don’t have the time/patience to sort through. This, too, is a new one in our household. Which I accidentally stumbled across when I left Lil’ Money in the bathroom for a hot 2 seconds, only to come back with half a roll all strung out on the floor. Ugh… He was spinning that bad boy right off its little holder there and thought it was just hilarious to watch the paper spew out in a never ending cycle… I’m leery to hand him a full roll in fear of what he may do, but I am quite confident he’ll enjoy it immensely. So I will be giving him 4 of these. 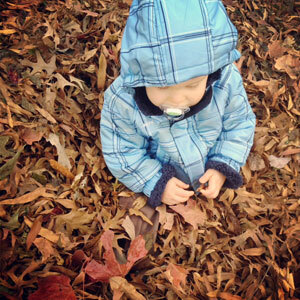 Every kid in the world LOVES to play (and throw) leaves around! And the bigger mess they can make, the better! So since it works so well *outside*for them, why not bring the joy *inside* and surprise them with a huge box full of leaves?! Particularly one where they could sit in it like a cozy little bed? 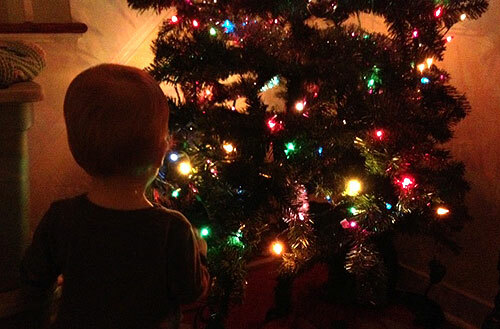 :) I’m not too sure how we, the parents, would like that in the end, but it could be possible to stomach for just a day in the holiday spirit… I’ll take one for the team, and report back. *Idea not proven yet. Possible alternates: A box of packing peanuts? So, needless to say my son will be one ecstatic little boy come Christmas morning. And the beauty of it is that it’ll only cost me the price of wrapping paper! I’m gonna crush this one… Get my Father-of-The-Year trophy ready! No toddlers were hurt in the making of this post. Packing peanuts stick to everything and I would worry about them ending up in a little mouth. A box big enough to get in to is the best present. Dishwasher size is perfect but a big box from the grocery store provides endless fun too. Fridge size would be amazing but that would take up a lot of room. Don’t forget some crayons to decorate the outside. Splurge on the Crayola brand as the cheap ones are full of lead. I had to buy a freezer and my sons loved the box. They even slept in their “fort” for several nights with one of the dogs. I agree with Jane about the packing peanuts. I bet they are real fun to bite into! I’ve always said I’m just going to give an empty box to little kids for Christmas, but anticipated criticism. Anything goes with your own kid though! The tupperware drawer at my mom’s house was super low so whenever my youngest sister was getting under foot we’d just open up the drawer. We lost a lot of lids under the fridge, but it was worth it! With the tissues and TP I’d be concerned that he’ll really think those things are toys and think it’s ok to unroll and empty the tissues and TP all the time. Still…. totally fun presents!!!!!! I got my youngest some measuring cups last year for the bath tub. (I was sick of them using mine!) They use them every day in the tub. Cheap and fun! So true! Bubble wrap didn’t make the cut? I still can’t pass the stuff up without at least popping one bubble. Exactly! My office had some stuff come in that was wrapped in bubble wrap – I managed to run off with it first, and I’m now hoarding it in my cube for terrible, horrible, no-good, very bad days. Every kid loves bubble wrap! Heck, I’m a grown adult and I still love getting my hands on a fresh sheet of bubble wrap! YEAH! How did that miss the cut??? Such great ideas for the little ones! I think my nephew would love to make a huge mess with a few tissue boxes :) However my sister-in-law would not think this is an appropriate gift.. sigh. I think I can get away with a handmade wooden puzzle, though – it’s fun and interactive for him and was less than $10 for us. Decent compromise! Not sure if this post is supposed to be cute or true. Be very careful about giving him things he can tear, rip, destroy, etc if you don’t plan to do it in everyday life. He won’t understand why he can unroll the toilet paper you gave him but not the stuff in the bathroom. Or why he can rip all the tissues out of the boxes he opens on Christmas Day but not the ones on the nightstand. It’s a cute idea but kids at his age will probably be confused by the mixed message. Not trying to put a damper on your idea. Just be careful what you let him do Christmas Day that you don’t want him to do the other 364 days of the year. If you’re looking to buy old remotes, most thrift stores have a bin near the electronics full of them. A lot can be purchased for about a buck. I’ve sold a few on eBay too! You just need to search completed listings with the model # of the unit that corresponds to the remote. Best part is they ship first class too! Great gift ideas! This reminds me that all the expensive toys that you are avoiding are marketed towards the PARENTS. Toddlers don’t yet care about the latest tickle me elmo and these gifts you have just outlined are way more fun for them! So adorable! You just have to appreciate how a child’s imagination can make some so mundane an absolute treasure. I used to love playing in boxes as a kid, so if we had a big item delivered to the house (or were moving) I’d be crawling in and out of cardboard all afternoon. The cheapest present my sister ever asked for was a bouquet of tootsie roll pops. I think my mom got them at the dollar store and my sister (who was 2) freaked out after opening them. It’s one of our favorite home videos. Wired had a list a couple years ago of the greatest toys of all time (some are for children a little older than toddlers). Their list was stick, box, string, cardboard tube and dirt. I think they nailed it and I think they could expand the list to include the ones you mentioned above. My little guess is obessed with “balls” right now. He just picks them up yells “ball” then throws it, yells “bounce” then runs up and yells “kick” as he kicks it. This repeats for hours. I love this list! You could also add pots and pans. My son would sit on the floor of our kitchen for hours with a spoon and a pot. Meanwhile, $100s of dollars of toys sat in the other room. We let our daughter pull out a whole box of tissues once and it made a huge pile and was super wasteful, but she was so proud. The other thing that kept her occupied forever was to let her go through my sock drawer and unmatch all the socks and throw them all over the floor. Tons of fun! Pretty soon your little guy is going to figure out even the “real” remote controls aren’t the ones that actually work the TV and he’ll demand those. We thought we were so brilliant giving the girls a real remote for an old TV box, but that didn’t last for long. Another thing to add to the list: bed sheets and couch cushions. They just love to build forts or even just pile all the cushions and pillows up and jump for hours! Don’t forget the solo cups! With bright colors; they can nest & stack; they can build castles (to knock down of course) and they make cool crinkly noises when you squish them! YES! Oddly enough you’re the 2nd person to send that to me this week – thanks :) Theirs is MUCH funnier. We find out today!! EEEEE!!!! I think that this really deserves the ‘father of the year’ trophy. At least it seems that you are having great time raising this kid. Remember the ‘MN principle of child raising’? Whatever you do they’ll likely ned up in therapy (and blaming you for all that goes wrong in their lives) so you may as well enjoy it. With us (son is nearly 13) it is expensive play machines at the moment. Well, isn’t he the cutest little kid?! Adorable! My husband told me I needed to read this post. I’m dying because we can relate 100%. Our girl loves Kleenex boxes and measuring cups and is *obsessed* with the remote and our phones. The last two are driving us crazy! As soon as we get around to it, we’re gonna hit up the thrift store and buy an old remote for her (but disinfect the you-know-what out of it first). This is by far the best toddler gift guide I’ve seen this year :). Cute Kid. I would say calculators over remotes, so the kid doesn’t become a couch potatoe and values financial calculations. You can get rolls of toilet paper for 60 cents at costco. Good list of gifts. Im getting mine some classy flashlights as stocking stuffers. On the one hand, I think that is awesome and award you kudos for being able to provide such simple gifts. On the other hand, I’m thinking that kid is going to be so confused. He’s been told no on those before and he will be able to go to town with the kleenex and toilet paper gifts. When he finishes those though and tries to do it with the regular items, it’ll be back to no. Oh well, kids are smart and I’m sure he’ll learn the difference. Father of the year! I have three kids and can assure you that your ideas are awesome. He will love it. Even my 7 year old would love it! Part of the fun of Christmas is going nuts and making a mess. Let him have at it, then clean it all up, toss it and do a repeat next year. Another suggestion: buy a big old roll of construction paper. I found a huge roll (seriously, it weighed a few pounds) of packing paper at a thrift store and bought it. Every now and then I’d tape it up on a wall (starting at the floor molding and going up, so little ones could reach it), and let my kids color the wall for a few weeks. This was my most genius idea ever. It kept them so happy! Another idea: measuring tapes! Not the big ones that dad uses (when they snap back they can pinch), but the little ones you find at Home Cheap-o near the front. My kids die for these! Great idea w/ the construction paper!!! I’ll have to try that one next year when he’s a bit older. Kids are hilarious, aren’t they? I heart this post. How cute that he loves the tissues! Toddlers are so much fun. Everything is a toy to them. We use to bring snow inside and put it in a shallow plastic bin. We would get beach shovels and pails for them. Our girls would go to town. Smart ideas here! I love when you can give cost-effective gifts that are more than just junky plastic toys that will be forgotten in a matter of days – allowing kids to use their imagination is so much better for them, and for your wallet! I wish that our joy about these type of simple presents lasted as we got older. When did I become bored with crushing a big pile of leaves? When did the kid within me let go of the fun that came from these type of simple objects? 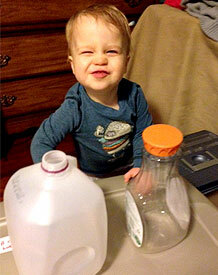 Also I can attest that you better wash out old milk jugs, if you don’t they totally reek. Little tip I picked up pressing my own apple cider and using old milk jugs as cider containers. If you keep saying those tissues are his (use his name–“Jack’s tissues”), then switch to “Daddy’s tissues” for the ones he cannot have, he will learn. There are dangerous heavy metals in cell phones, so I am not sure giving him an old one is a good thing. 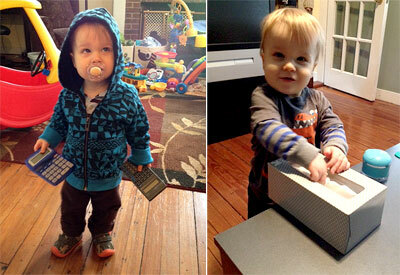 Remove all batteries before a child plays with a remote or cell phone. Good idea with labelin them HIS tissues. Another thing that could possibly come from this is he now thinks they’re no longer no-no’s and doesn’t *want* to play with them later anymore? Ha ha, you got me laughing in recognition. Baby Skint is 18 months and this list would be all her Christmases come at once! I’d add in a packet of baby wipes/wet ones, so she could pull them out one by one then ‘clean’ everything in sight. Hope she keeps up that habit till she’s 20! Baby $ is adorable btw. lol I love it, man. Seriously, why do we spend so much freaking money on our kids when they are just as easily entertained with something cheap? Although, your son is probably going to look at old pictures when he’s older and think, WTF? Did my parents hate me? For real. My almost 5 year old LOVE TAPE ZOMG. He freaked the heck out the other day when I got him a tape dispenser and some rolls. When I told him the tape was longer than a football field, he lost his dang mind. Long as a football field, hahahhaha… that IS pretty cool! This post is fantastic! Especially since I just sent a text to my family joking that my 6 month old currently enjoys playing with/crumpling up sheets of paper and would like more for Christmas. She also loves remote controls. As a kid, I enjoyed playing in laundry baskets and my sister and I made an epic fort in a refrigerator box. PS – if you’re feeling crafty, here’s how to make a “fake” diaper wipe box using fabric scraps. It would be similar to giving tissue boxes. I’m not sure if your son will prefer the real thing, but it’s worth a shot. We’re gonna celebrate Christmas on the 26th this year. I’ll go around the neighbors’ trash cans and get all the cardboard boxes, bows, wrapping paper, and plastic packaging. Then throw that stuff into my 1.5 year old’s room. He will certainly soil his diaper with excitement after he sees all those “gifts”. So true! My son is almost 6 months so this post is timely. I’m sure he’ll have more fun with the wrapping paper than anything he could possibly get. Man he loves the sound of crumpling paper! Previous post: Giving Away a Solid GOLD COIN!! Next post: It Can Happen to Any of Us.